This was my first attempt at working with a chart. I have had this pattern for over twenty years and finally did it! This is an Annie’s Attic pattern and can be found on Ravelry. Wow! That is a piece of art! Stunning! It looks like very fine stitches and lighter weight yarn? Beautiful. I have come across this pattern and would love to do it, did you use bobbins for all the color changes or carry yarn. Througout? Very beautiful work! Definetly a prize winning afghan! I carried yarn throughout. Work is not turned. Each row starts at one end leaving a length for fringe and ending with length for fringe. Beautiful. A piece of art. Great job. Charlotte, just finished mine..love it. But carry 4 strands of yarn was a bear to keep untangled. Any tips to make that easier? Tweetybird, it was a pain to carry the yarn but I did it. No tips, sorry! I’ve since worked with bobbins. Much easier. 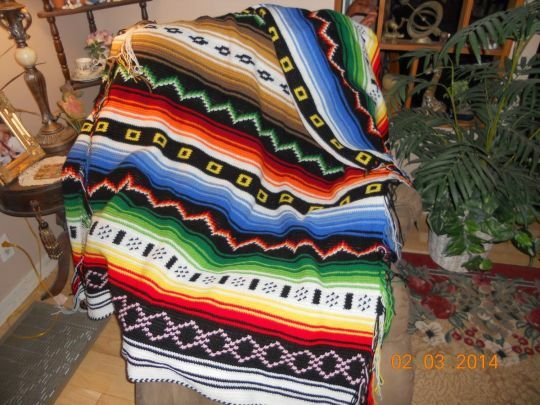 All your work is just beautiful, but I really feel in love with the Navajo afghan! This is absolutely gorgeous! Love it! !